What is "Samsung Galaxy S9+ — Jio Buyback Offer -2018"? 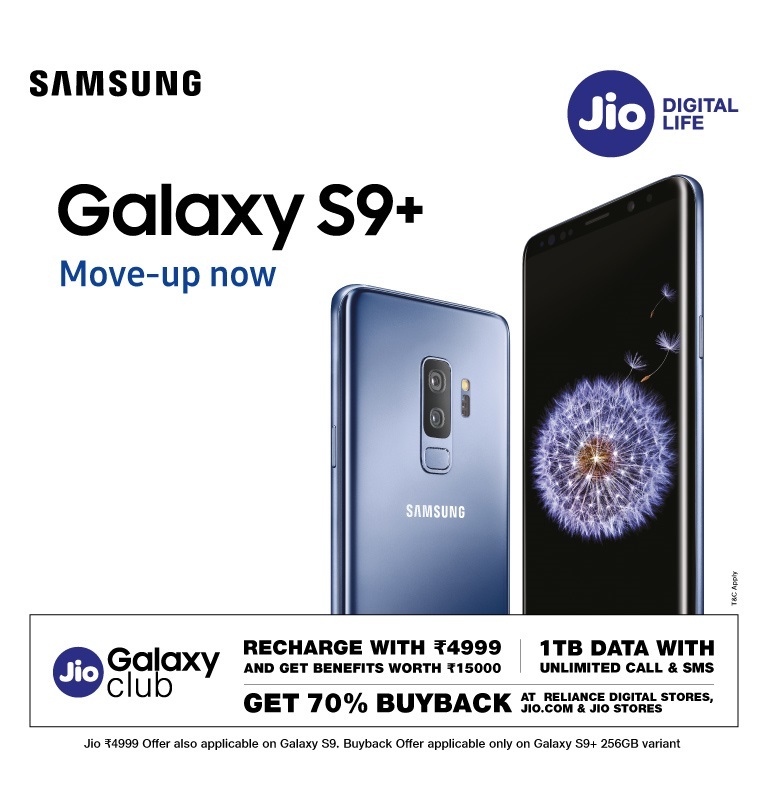 "Samsung Galaxy S9+ — Jio Buyback Offer — 2018" entitles Jio prepaid subscribers to purchase Samsung Galaxy S9+ 256GB from any Reliance Digital, physical or online stores (Reliance Digital or Reliance DX Mini/Jio Store or Jio.com) and opt for the buyback scheme that assures 70% buyback value. What Samsung Galaxy models are eligible for the offer? 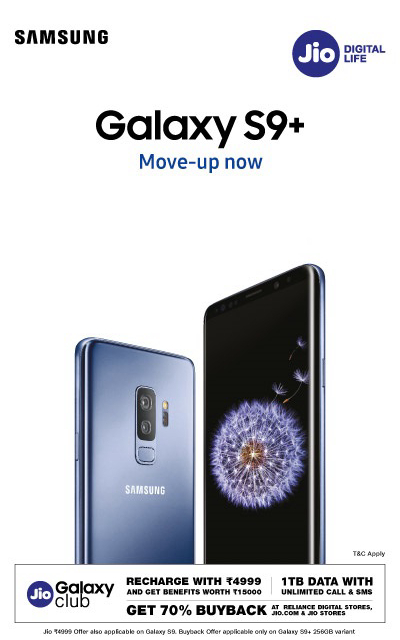 The offer is applicable on Samsung Galaxy S9+ 256GB purchased from Reliance Digital stores (Reliance Digital or Reliance DX Mini/Jio Store) including jio.com only. How long is the "Samsung Galaxy S9+ — Jio Buyback Offer -2018" valid for? The offer is valid for Samsung Galaxy S9+ purchased from Reliance Digital Store (Reliance Digital or Reliance DX Mini/Jio Store or Jio.com) on or after 16th March, 2018 and activated on the Jio network on or before 15th June 2018 by the eligible subscriber. What is the eligibility criteria for availing the "Samsung Galaxy S9+ — Jio Buyback Offer -2018"? You must purchase Samsung Galaxy S9+ 256GB device from Reliance Digital Store (Reliance Digital or Reliance DX Mini/Jio Store or Jio.com) on or after 16th March, 2018. You must latch on Jio network with Galaxy S9+ 256GB device, on or before 15th June 2018. You must use an Jio SIM in SIM Slot 1 (IMEI 1) of the Samsung Galaxy S9+. You must be an active Jio subscriber while availing the offer and continue to be an active Jio subscriber while availing the buyback voucher. You must be enrolled to the Jio Prime membership plan. You must have recharged a minimum aggregate prepaid recharge value of Rs. 2,500/- or above within a year from the date of purchase of the Samsung Galaxy S9+. What is the redemption period for the "Samsung Galaxy S9+ — Jio Buyback Offer -2018"? The redemption period shall be from 16th March 2019 till 15th June 2019 at Reliance Digital stores (Reliance Digital or Reliance DX Mini/Jio Store) only. How to enroll for the "Samsung Galaxy S9+ — Jio Buyback Offer -2018"? How would I know that I can redeem the Samsung Galaxy S9+ — Jio Buyback Offer? After successful payment of enrollment fee during the purchase and upon performing recharge, a voucher will be credited at the end of 12 months from the date of purchase of the device in your MyJio app. How do I redeem the "Samsung Galaxy S9+ — Jio Buyback Offer -2018"? To avail the buyback voucher, you may visit one of the Reliance Digital stores during the 13th month from date of purchase of the device, along with the voucher received in the MyJio app at the end of 12 months from the date of purchase of the device after performing recharge, original invoice, product box and all the accessories supplied at the time of purchase of the device. What condition of the product and the accessories will be accepted for availing buyback offer? You must surrender the Device to RRL at the Reliance Digital Store, in a virus-free and in working condition without any active password or other locks being enabled and without any physical or functional damage (save normal wear & tear). What is the validity of the voucher availed under the "Samsung Galaxy S9+ — Jio Buyback Offer -2018" offer? The buyback voucher availed by you is valid to be redeemed within a period of three months from the date on which such buyback voucher is made available to you. It may be utilized against purchases made by you in a Reliance Digital store. Is the "Samsung Galaxy S9+ — Jio Buyback Offer -2018" applicable to existing Jio subscribers as well? Can I avail any other Jio offer along with the "Samsung Galaxy S9+ — Jio Buyback Offer -2018"? No, this offer cannot be clubbed together with any other offer of similar nature. Where can I get a new Jio SIM to avail the "Samsung Galaxy S9+ — Jio Buyback Offer -2018"? Will the "Samsung Galaxy S9+ — Jio Buyback Offer -2018" offer be available, if I purchase Samsung Galaxy S9+ device from other stores or ecommerce sites? No, "Samsung Galaxy S9+ — Jio Buyback Offer -2018" is available only for Galaxy S9+ 256GB variant, exclusively purchased from Reliance Digital Store (Reliance Digital or Reliance DX Mini/Jio Store or Jio.com) in India during the offer period. Will the "Samsung Galaxy S9+ — Jio Buyback Offer -2018" offer be available, if I switch my Jio number to any other Samsung mobile/tablet or other device manufacturers? No. The Samsung Galaxy S9+ — Jio Buyback Offer 2018 will not be applicable in this case. "Samsung Galaxy S9+ — Jio Buyback Offer -2018"
"Jio Buyback Offer" or "Offer" shall mean this offer enabling an Eligible Subscriber to avail the Buyback Value on the Eligible Device in accordance with the terms and conditions herein recorded. "Buyback Value" shall mean 70% of the invoice value (excluding taxes) of the Eligible Device. "Buyback Voucher" shall mean the voucher for the Buyback Value that an Eligible Subscriber may avail under the Offer. "Eligible Device" shall mean (i) Samsung Galaxy S9+ 256GB mobile devices of Samsung India Electronics Pvt. Ltd. ("Samsung"); and (ii) purchased at a Reliance Digital Store or Jio.com on or after 16th March 2018; and (iii) activated on the RJIO network, for the first time, by an Eligible Subscriber, on or before 15th June 2018. "Eligible Subscriber" shall mean a person who (i) has purchased an Eligible Device; and (ii) enrolled for Jio Buyback Offer by paying Enrollment Fee; and (iii) uses RJIO SIM in SIM Slot 1 (IMEI 1) of the Eligible Device; and (iv) is an active prepaid subscriber of the RJIO services on the date of availing the Offer and continues to be an active subscriber of RJIO services on the date of Buyback Voucher Availment; and (v) is enrolled to the "Jio Prime" membership plan; and (vi) has performed the Eligible Recharge. "Eligible Recharge" shall mean recharge(s) performed for a minimum aggregate prepaid recharge value of Rs. 2,500/- or above within a year from the date of activation on the RJIO network on the Eligible Device. "Enrollment Fee" shall mean a one-time payment of Rs.500 at the time of purchase of the Eligible Device. "Buyback Voucher Availment" shall mean process of availing the Buyback Voucher as stipulated in the Offer during the Buyback Voucher Availment Period. "Buyback Voucher Availment Period" shall mean the 13th month from the date of purchase of the Eligible Device. "Redemption" shall mean the redemption of the Buyback Voucher in terms of the Offer. "Offer Period" shall start from 16th March 2018. "Reliance Digital Store" shall mean retail outlets of RRL, called as Reliance Digital, Reliance DX Mini/Jio Store. Eligible Subscriber shall be liable to remove the SIM card from the Eligible Device before returning the same. Returning the Eligible Device does not cancel the Eligible Subscriber's service contract with RJIO. RRL/RJIO recognizes that the choice to be contacted for promotional messages and alerts is that of the Eligible Subscriber. RRL/RJIO intends to keep the Eligible Subscriber informed on matters relating to the Offer and any upcoming offers from RRL/RJIO for the benefit of the Eligible Subscriber. Accordingly, by availing the Offer, the Eligible Subscriber hereby consents to be contacted by RRL/RJIO and such consent shall remain unaffected by the Eligible Subscriber's registration in the National Do Not Call ("NDNC") registry under the relevant category stipulated therefor. The Eligible Device shall be used by the Eligible Subscriber on an 'as is' basis and shall not be tampered with, including but not limited to, by way of rooting attempts, reverse engineering, unlocking or jail-breaking of the Eligible Device or original firmware(s) or software(s) of the Eligible Device.